OTTAWA, February 21, 2018 – The founders of Saucier + Perrotte Architectes, a Montreal firm that for 30 years has consistently produced refined, elegant and modern buildings – many for the public – are the recipients of the 2018 RAIC Gold Medal. 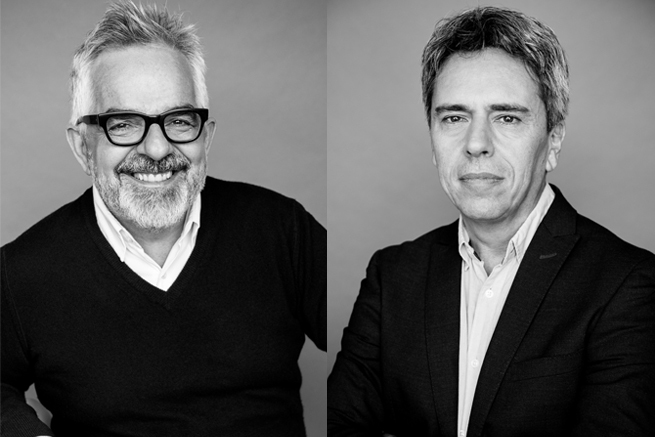 Gilles Saucier, FIRAC, and André Perrotte, FIRAC, founded Saucier + Perrotte Architectes in 1988. The firm represented Canada at the Venice Architecture Biennale in 2004 and has received more than 100 awards, including eight Governor General’s Medals in Architecture and the Government of Quebec’s Prix Ernest Cormier for lifetime achievement. Their work has been published widely. The Gold Medal is the highest honour the Royal Architectural Institute of Canada (RAIC) can bestow. It recognizes a significant and lasting contribution to Canadian architecture. The Gold Medal will be presented at the RAIC/AANB Festival of Architecture, taking place in Saint John from May 30 to June 2. Saucier+Perrotte have designed theatres (Usine C and Cinémathèque Québécoise in Montreal); commercial spaces, (the Michel Brisson boutiques and Scandinave Les Bains Vieux Montreal); garden pavilions (First Nations Pavilion at the Botanical Garden in Montreal), and the Canadian embassy in Abu Dhabi. The firm’s university projects include the Perimeter Institute for Theoretical Physics in Waterloo and the UBC Faculty of Pharmaceutical Sciences (with Hughes Condon Marler Architects) in Vancouver. They have also completed sports facilities such as the new Stade de Soccer de Montréal (with HCMA Architecture + Design), as well as private residences, exhibitions and art centres. Ongoing major projects include River City, a 1,000-unit LEED Gold master plan in Toronto. Mr. Saucier is the firm’s design partner while Mr. Perrotte is the project architect in charge of coordinating the design and construction process. Both are graduates of the Laval University school of architecture in Quebec City, and have lectured and taught across Canada and abroad. One of their nominators, Martin Bressani, MRAIC, director of the school of architecture at McGill University, noted that Saucier + Perrotte “marked a watershed in Canadian architecture, initiating a second modernist wave, one that risked new experimentation, and displayed a much greater sensibility to atmosphere. “From the start, theirs was a public architecture, at the service of culture and a collective identity,” wrote Bressani. Previous Gold Medalists include Peter Busby, FRAIC,His Highness the Aga Khan, Bing Thom, FRAIC, George Baird, FRAIC, John and Patricia Patkau, FRAIC, Dan Hanganu, FIRAC, Bruce Kuwabara, FRAIC, Arthur Erickson, FRAIC, Phyllis Lambert, Moshe Safdie, FRAIC, Raymond Moriyama, FRAIC, and others.